How many myths and legends of human kind can be packed into a coffer measuring 10.9 by 25.3 by 15.9 centemetres? As it turns out, quite a few. 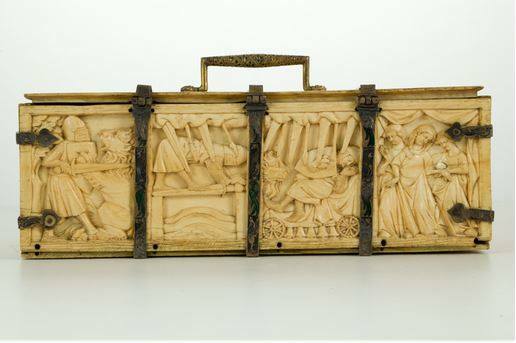 In the collection of the Wawel Cathedral Museum, Cracow, Poland, there is a small casket adorned with fifteen different scenes depicting legendary heroes and heroines. Made of ivory it is an object of the finest craftsmanship and exquisite beauty. With all probability it was made in Paris in the early 14th century. According to tradition it is associated with Jadwiga Andegaweńska (Hedwig of Anjou), the queen and patron saint of Poland. The High Middle Ages saw the flowering of literature and art exploring literary motifs. Europe burnt with Arthurian zeal which from the British Isles and today’s France spread as far as the Iberian Peninsula, Italy and Scandinavia. The romances featuring both Arthur himself and his valiant knights also made their way to the courts of Central Europe. Pages of the manuscripts, castle walls and objects of everyday use, were decorated with scenes depicting their marvelous exploits. Put on display in the museums of both Europe and America, there are only seven such caskets surviving in the world today. The one preserved in Poland has been illustrated with popular medieval themes, dealing mainly with the subject of courtly love and with scenes from Arthurian romances. Among the seven survivors it is the only one to represent a complete depiction of the assault on the metaphorical Castle of Love. The left end depicts Tristan and Isolde spied upon by King Mark. The right end shows Galahad receiving the key to the castle of maidens. At the back are Lancelot and the lion, Lancelot crossing the sword bridge, Gawain asleep on the magic bed, and the maidens welcoming their deliverer. The front panel is a depiction of the love tragedy of Pyramus and Thisbe and less poignantly Phyllis riding Aristotle. Ancient in origin these were motifs eagerly explored in medieval art and literature. 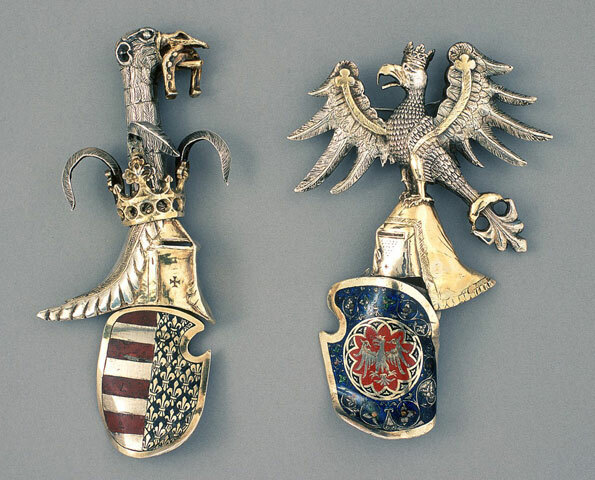 Little wonder that the casket has been associated with Queen Jadwiga (Hedwig). Jadwiga (1373-1399) was the daughter of Louis the Great, the king of Hungary, Croatia and Poland, and niece of Casimir the Great, the king of Poland. Raised in the highly sophisticated and cultured Hungarian court she showed keen interest in the patronage of scholars and learning. Poland’s first university (today Jagiellonian University) in Cracow owed much to her efforts and care. 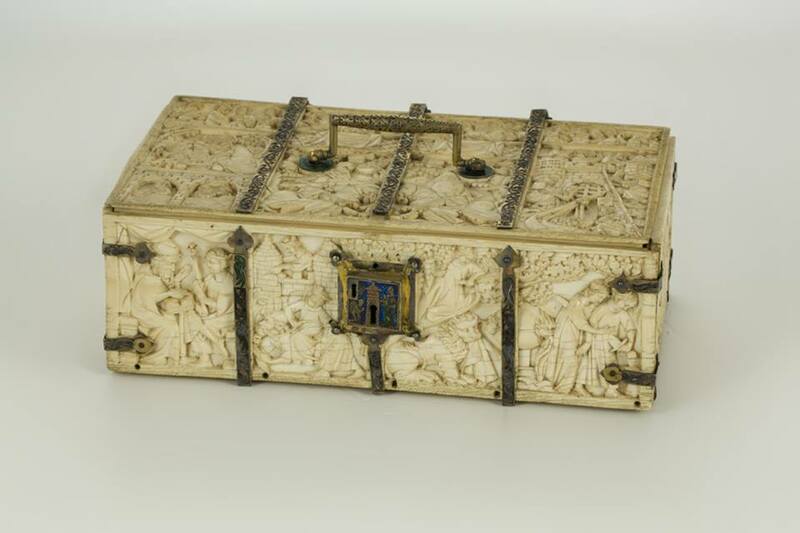 In the collection of the Wawel Cathedral Museum the casket is not the only object associated with Queen Jadwiga and not the only one to depict the Arthurian legends. 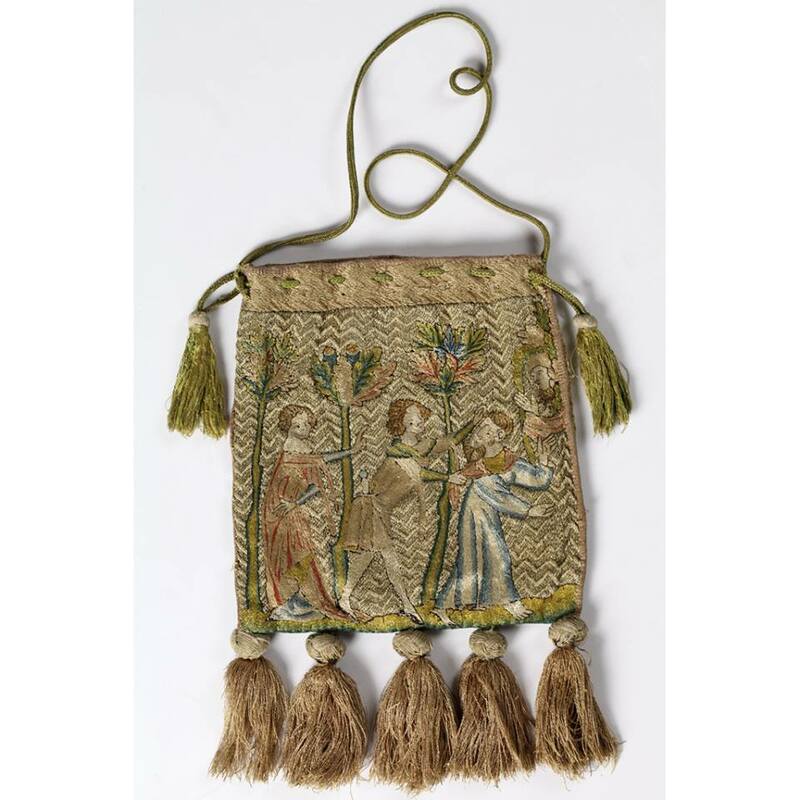 Put on display together with the casket is a small purse also made in Paris in the first half of the 14th century embroidered with the scenes of the legend of Tristan and Iseult. 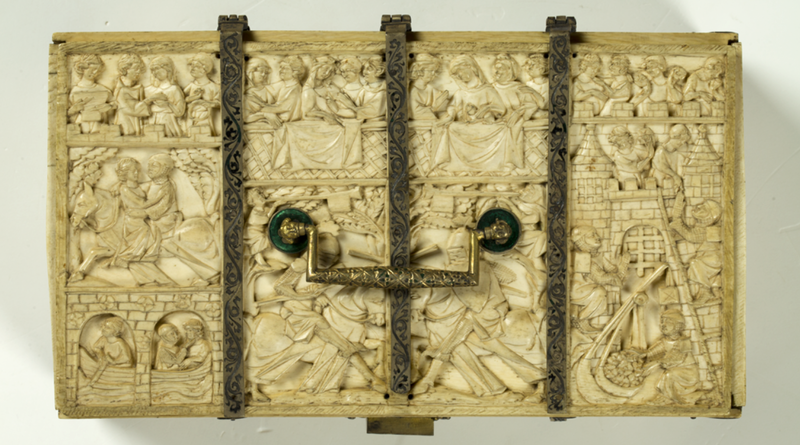 The Wawel casket and purse are not isolated examples of Arthurian art in Poland. A truly remarkable survivor can be found in Siedlęcin, an obscure little village near Jelenia Góra, Lower Silesia. 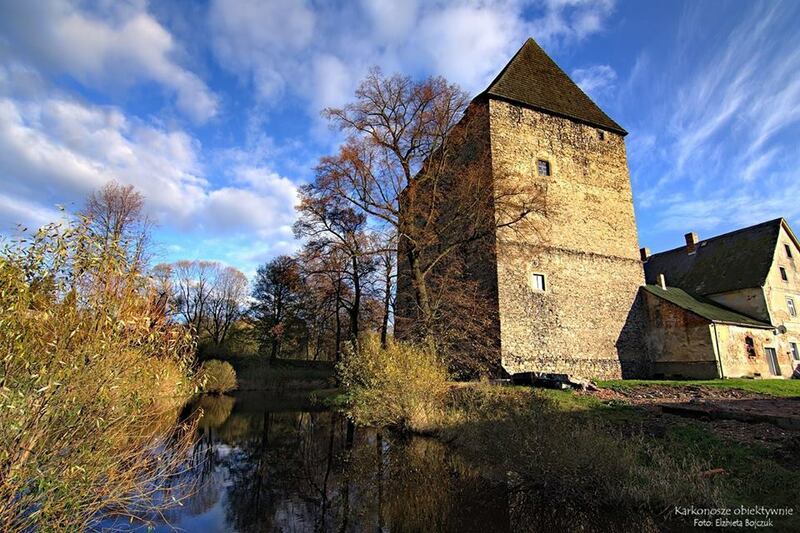 There, on the bank of the River Bóbr, sits a medieval tower-house, one of the largest and best preserved in this part of Europe. Its fabric dates from the early fourteenth century, with the present roof added in the sixteenth century. Its greatest glory, however, comes from elsewhere. Sometime in the 1330s the southern wall of its Great Hall was adorned with paintings depicting the marvelous exploits of Sir Lancelot of the Lake. 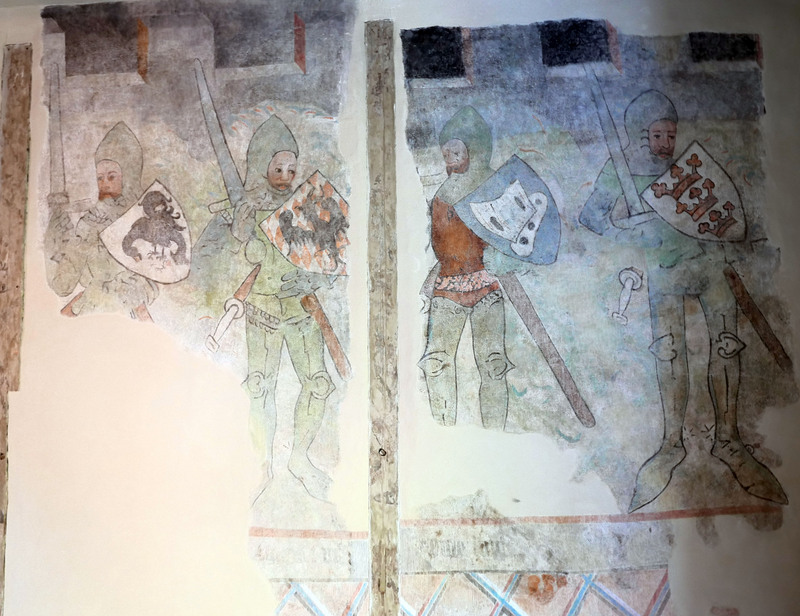 Today, being the only Lancelot wall paintings preserved in situ, they rank among the most outstandingly complete and well preserved medieval wall paintings in Europe. Another example of Arthurian art preserved in Poland is Zielona Komnata [the Green Chamber] in St Hedwig’s Tower at the castle of Legnica, with the representations of the Nine Worthies. In medieval art, architecture and illuminations the Nine Worthies motif became enormously popular. The Nine Worthies were a group of nine powerful rulers and the greatest conquerors who ever lived. They included three classical pagan heroes (Alexander the Great, Hector, and Julius Caesar), three Jews (David, Joshua and Judas Maccabeus), and three Christians (Charlemagne, Arthur and Godfrey de Bouillon). The paintings in the chamber were comissioned in the early 15th century by Ludwik II of Brzeg (Louis II of Brieg), the worldly duke who founded the chivalric order of Rudenband. The chamber itself in many ways resembles the one at Windsor Castle where the members of the Order of the Garter hold their meetings. In December 2016, a remarkable discovery was made in one of the burgher houses in the Old Town of Toruń. Toruń is a remarkable city with medieval wall paintings preserved in almost every church and even more exceptionally in burgher houses where numerous secular examples survive. The latest sensational discovery was made by chance, during major repairs in the house at 16 Żeglarska Street. The paintings were created c. 1400 and represent the International Gothic. They depict the Nine Worthies, King Arthur himself among them. Major conservation works were carried out and completed in the early 2017. Wonderful, fascinating pictures and information!